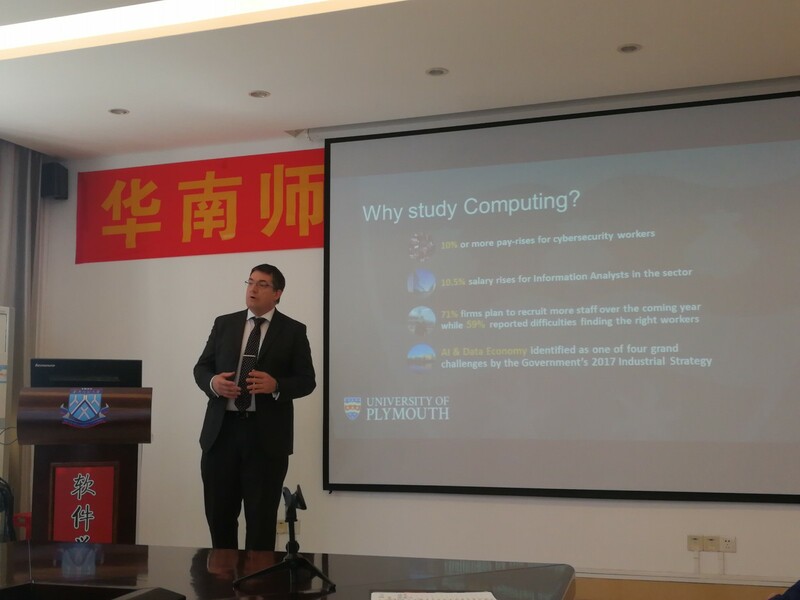 The afternoon of March 11, professor Steven Furnell, associate dean of the School of Engineering of Plymouth University, and Ms. Rebecca Peng, head of the China Office, visited the School of Software of SCNU. 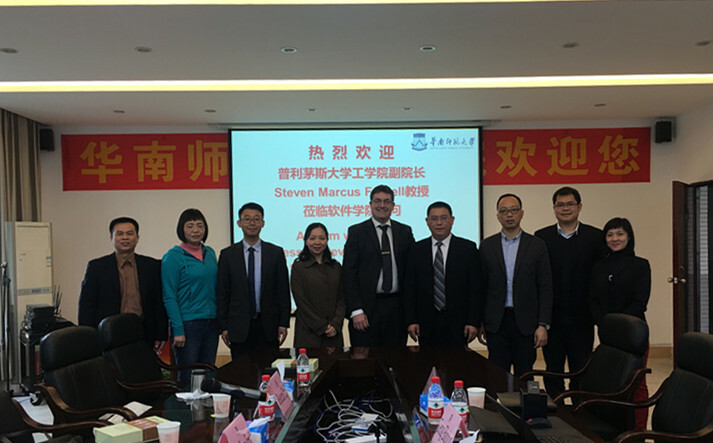 Dean of the School of Software, Zeng Biqing, Chen Huan, vice dean, Wang Xinxu, deputy secretary of the Party and others warmly welcomed professor Furnell and his delegation, and held talks on project cooperation and other topics. Steven Furnell first elaborated on the location, professional setup and academic influence of Plymouth University to the teachers and students of the School of Software. He highlighted the discipline development of the computer major in the college and answered questions about curriculum assessment, scholarship application and core competition that tstudents were interested to ask. 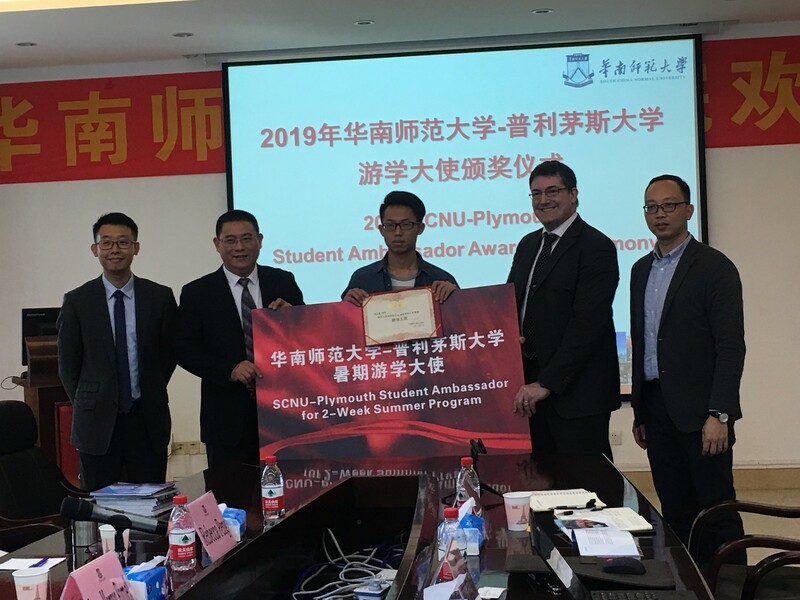 Then, the awarding ceremony for the 2019 summer ambassador of South China Normal University-Plymouth University was held. Zeng Biqing and Steven Furnell jointly awarded the scholarship and certificate to the ambassador of the School of Software Engineering, He Zhihao. On behalf of South China Normal University, He Zhihao will participate in the 2019 Summer Study Tour of Plymouth University to study some of the best courses at the university and experience British culture. 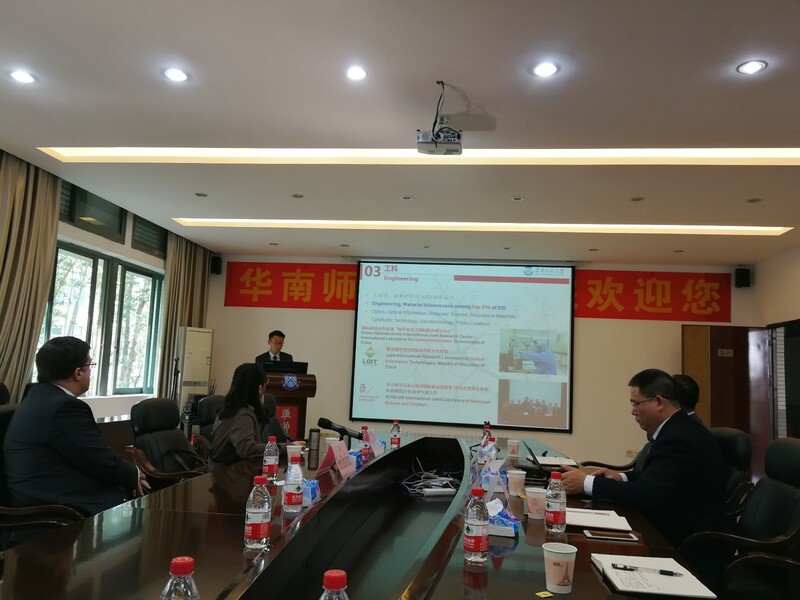 After the awarding ceremony, the two sides discussed the exchange of undergraduate and master's students, the Sino-British master's connection project, teacher's scientific research cooperation, teacher's visits to the UK, and British professor's lectures in China, and reached consensus on a preliminary cooperation agreement. Since the establishment of the International Union College on the Nanhai campus, the School of Software has closely followed the school's strategy of the internationalization, and has actively deepened communication and exchange with famous universities around the world, such as the University of Aberdeen, Plymouth University, and Curtin University in Australia. 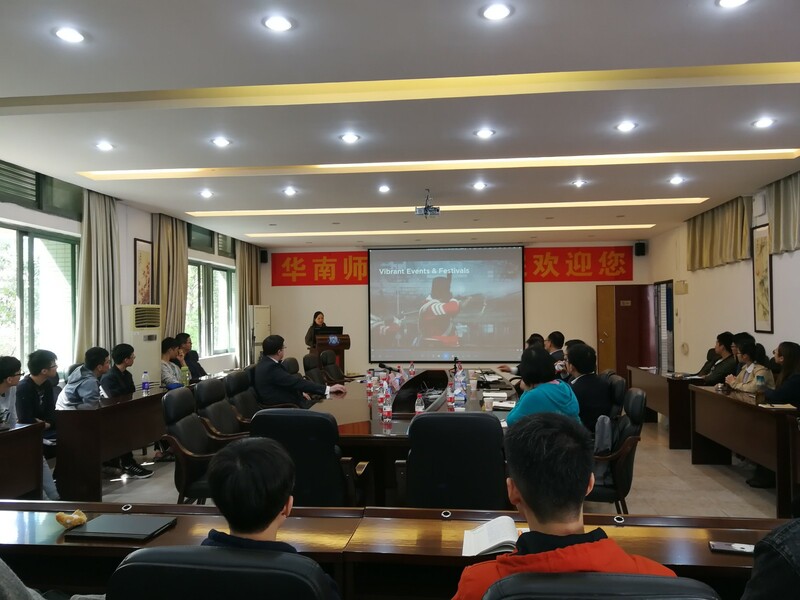 The School of Software aims to excel in joint Sino-foreign cooperative education, and strives to raise the internationalization level of the university's talent training. It intends to make due contributions to the school's efforts at creating a high-quality talent team, conducting high-quality scientific research and innovation, while vigorously promoting internationalization, and further promoting informationization, thus fulfilling the school’s "double first-class" development strategy.